In order to assemble the rigged parts of your character in the Timeline view, you need to use a Kinematic Output layer. Select the element to attach to the Kinematic Output node, such as the hand or head peg. From the top menu, select Insert > Kinematic Output. The node appears in the Timeline view as a parent of your selection. In the Timeline view, drag and drop the Kinematic Output layer ONTO the deformation layer you want your limb or piece to follow. For example, onto the neck deformer if you want your head to follow it without being deformed or onto the arm deformer if you want your hand to follow. If your pieces are no longer ordered properly, use the Z-nudging feature to reorder them—see About Ordering Layers. 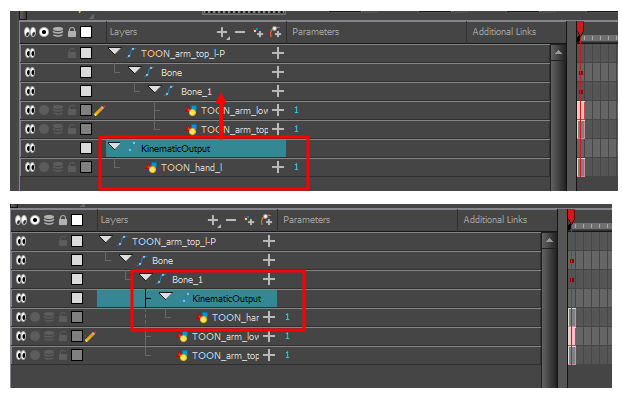 It's good practice to rename the Kinematic Output layer to reflect which deformer it is assigned to as the Timeline view can become very large and layers can be positioned far apart. Select the Kinematic Output node and in the Layer Properties window, rename the node. You can also double-click on the layer's name.